COUNTRY'S FAMILY REUNION NEWS PAPER COMES RIGHT TO YOUR MAIL BOX EVERY MONTH. ​ DON'T MISS A SINGLE ISSUE. Download the February 2015 newspaper below to read this issue. These beautiful 8 1/2 x 11, full color books include every issue from the previous years. Country Music news from 2017 was full of happiness and tragedy. We lost some incrediable country music legends and celebrated birthdays and new births. All 12 months is in the beautifully bound book, month by month. There are articles, new releases, questions ask and answered and lot of pictures. Read about your favorite legend from Lorretta Lynn to Mo Pitney. We have special articles written just for our fans. 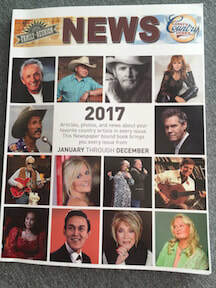 There is 239 pages of pure country news for you to enjoy.